Dujon completed a Bachelor of Medical Science in 2009, conducting clinical research within a regional ophthalmology practice (Bendigo Eye Clinic). He grew up in Bendigo and is interested in pursuing a medical career within regional and rural Australia. Dujon’s other interests include playing Australian Rules Football, athletics and playing the guitar. Andrew is a Victorian-based ophthalmologist who grew up in Tasmania. After attending medical school in Hobart, Andrew completed his ophthalmic training at the Sydney Eye Hospital. To further his knowledge, he followed with a fellowship at the Royal Victorian Infirmary in Newcastle-Upon- Tyne in the United Kingdom. Andrew has practiced in a variety of locations throughout Victoria since the mid 1990s, including Footscray, Brighton, Shepparton and Bendigo. He is a Consultant at the Royal Victorian Eye and Ear Hospital, where he participates in the registrar surgical training programme. Andrew lives in Melbourne with his wife Tracey and three daughters. Figure 1. Right fundus of Case One, eighteen months prior to the time of presentation with decreased left visual acuity. A vitelliform macular lesion typical of Best disease is present. Juvenile Vitelliform Dystrophy (Best disease) is a degenerative macular condition that is genetically inherited. 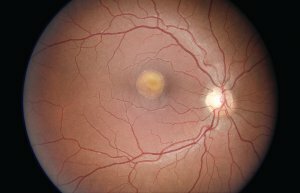 In recent years monoclonal antibodies have been employed to help prevent the decline in vision associated with macular fluid. This report documents the use of intra-vitreal bevacizumab in two siblings (aged thirteen and fifteen) with Best Disease. This work studies the changes observed in visual acuity and macular oedema over a 39 and nineteen week period respectively.